As we age, we have a lot to look forward to: becoming financially stable, settling into our identities, becoming confident in our career decisions, traveling, or possibly starting a family. However, regardless of these potential benefits to aging, there is often a common struggle that many adults bring into therapy: making new friends in adulthood. Growing up, making friends may have seemed like a breeze; you made new friends on the playground, in school, in your neighborhood, in extra curricular activities, or in your classes in college. You then leave these structured environments to move to a new city, start a new job, settle down, or move to make a fresh start and suddenly it may feel significantly more difficult to make new and lasting relationships. Social connectedness is crucial to our well-being, therefore, when connection is lacking, many people begin to feel isolated, undesired, sad, and alone. If you are currently struggling to make new and lasting connections as an adult, below are a few tips that you can try to help increase your social connection with others. There are most likely some people you have met throughout your life who you connected with. This may be a best friend from high school or college, a neighbor you haven’t talked to in awhile, or a friend you just haven’t seen in some time because you are both “too busy”. Start by reaching out to them with a text message and try to find a time to meet up for dinner or drinks. This may feel awkward as it may have been too long since you last spoke or you feel you aren’t good at making friends to begin with. Regardless, try your best to put yourself back out there to those familiar to you. This may feel daunting with everything else you have going on in your life, but try volunteering, joining a sports club, or cooking class. If you engage in these groups regularly, you will begin engaging with others who enjoy and care about similar things as you. Once you have something in common it makes the connection stronger and easier to maintain. There has most likely been a time when you wondered, “Why don’t any of my friends invite me to anything” or, “No one ever texts me”. Many times we tend to blame others for our friendships fading when we are not reaching out either. Make the effort to keep in touch with friends every two weeks by texting or meeting up with them. You may find that you are invited to more activities and events because you have become more present in their lives. Once you do connect with someone, make sure you are actively listening to them during your conversations. Try reflecting back what you hear to them in your own words to let them know you are paying attention. Maintain eye contact and display emotions that let them know you care about and understand them. Actively listening to others help you both to feel more comfortable and connected with each other and will allow you to be vulnerable with them as well. 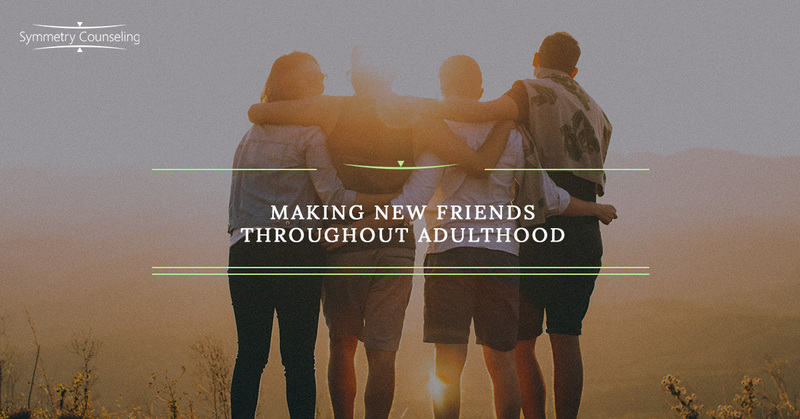 If you are currently finding it difficult to meet new people and making lasting friendships in adulthood, it may be useful to connect with a therapist. Contact Symmetry Counseling at 312-578-9990 to set up an appointment with one of our very skilled therapists today!